In spite of all the research going on around the world, there is still no ideal way to store electrical energy. 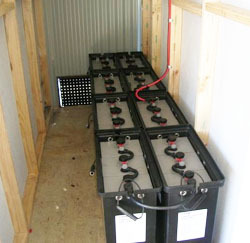 Batteries are still the gold standard for most off-grid homes. Off-grid power system owners are always looking for ways to capture and store energy since there is no AC power grid to do an energy exchange with. Like a careful money manager, they have to try and make more energy than they need and put some aside for a rainy day. Poor weather means pulling energy from the savings account. When their account (battery) in empty, they then have to fire up their gasoline or diesel generator and replenish the battery reserves. Many off-grid homes will have a combination of solar panels on the roof for both heat and electricity and one or two wind generators. Solar panels are more steady state energy machines while wind generators are erratic and unpredictable. But, seasonal trends can often mean long periods of windy weather. The off-grid owner would love to be able to harvest the energy from those surplus periods and store it for later use. If no long-term storage is available, often the excess power from a wind generator will have to be diverted to other loads or simply thrown away. Often these ‘”load dumps” are just nickel chromium (Ni-chrome) heating elements. In the winter, that heat can be used to heat the home but in summer it may have to be thrown away. Off-grid owners would love to be able to harvest this excess energy and store it for a rainy day. Various ways have been tried over the years to store this excess energy. 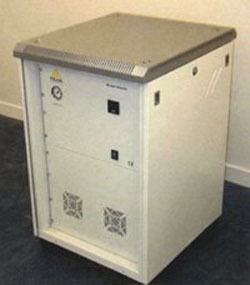 One potential storage method is hydrogen gas. But just how practical is it? 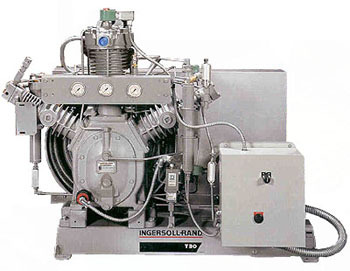 Hydrogen gas is typically produced by feeding electrical power to an electrolysis type hydrogen generator, like the units shown below. The process splits water into oxygen and hydrogen gas. The oxygen is thrown away. The hydrogen is collected and then pressured in some large storage tank. But, just how much energy can be stored using this method? 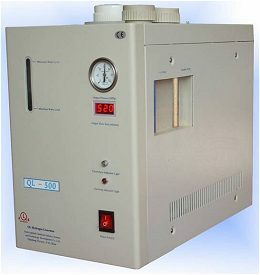 The electrolysis process is only about 60% efficient under the best of systems and more like 50% in others. I’m imagining an off-grid home with a fairly large wind generator. Perhaps it is one, which can crank out 10KW. Let’s say that a seasonal windy period occurs and lasts a full 24 hours each day and continues for total period of 10 days. That is a total of 240 hours. 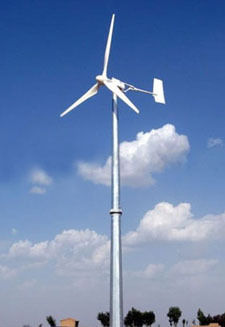 At 10KW, the total electrical energy from the wind generator would be 2,400KW-hours. When converted to joules, this is 8.6 x 10^9 joules. Assuming only 50% of that energy would be converted into hydrogen, then 4.3 x 10^9 joules worth of gas would be produced. An off-grid homeowner would love to be able to store that much excess energy. Even with all the losses, 1000KW-hours might be equal to two full months of the home’s needs. A quick search on the Internet puts the energy density of hydrogen at about 10,000 joules per liter at standard pressure. If we divide 4.3 x 10^9 joules by 10,000 we get 430,000 liters of pure hydrogen, which could be produced during this 10 day windy period. Using ideal gas laws, if we start with hydrogen gas at standard pressure and then pump it into a tank at 130 pounds per square inch above atmospheric pressure the volume should drop by the ratio of standard pressure to the tank pressure. This is close to a 10:1 ratio. So, the pressured gas will take up 430,000/10 or 43,000 liters of volume. There are 3.78 liters per gallon, so this translates into 11,375 gallons. This is a rather large volume. 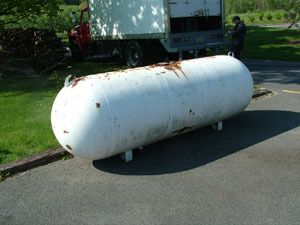 For reference, below is a 500 gallon propane tank. Storing 11,000 gallons of pressured hydrogen would require 22 such tanks. That is just not practical. In comparison, liquefied propane under pressure has an energy density of 25.3 x 10^6 joules per liter. 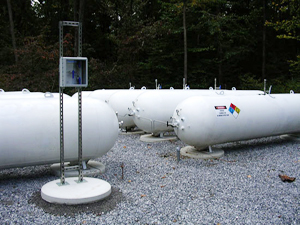 A 500 gallon propane would store 3.35 x 10^9 joules. This is not far from the total amount of hydrogen generated in our example above. So, even when pressured to 130psi, storing hydrogen gas in a large steel tank is just not very practical. Is it any better if the pressure is much higher? 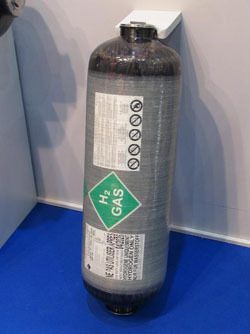 As shown below some very high pressure hydrogen tanks are available. The carbon fiber reinforced tank below holds 3.4 gallons of hydrogen at a pressure of 10,000 psi. But, even at this pressure, it would still take 42 of these smaller tanks to hold the gas produced by our hypothetical hydrogen gas production during a 10 day windy period. In conclusion, it just doesn’t seem very practical to use hydrogen gas for energy storage. The volume of the storage tank needed is just too large to be useful.